On Saturday, June 21, 2014, Hana Russell said goodbye to GSM in the best way a student can: by playing live at one of our outreach performances. Thank you very much Hanna, you have done this so many times for us and for the organizations we serve. This time it was for Make Music Chicago and the venue was Argo Tea State St. In previous opportunities, Hana played for Forest Park Chamber of Commerce, Oak Park Chamber of Commerce, the Children’s Hospital, and many more. Hana started studying with Mrs. Gasse when she was in 5th grade and she progressed to Book VI in the Suzuki Violin School. 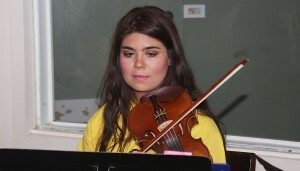 She was playing with the Symphony Orchestra at OPRFHS where she graduated as an honor student in May. Hana joined the GSM chamber music program in the Fall of 2009. There she gained a great deal of leadership and musicianship. Her progress both technically and musically is remarkable. Hana comes from a family where music always takes an important place. Her parents not only supported her practicing and following her teacher’s coaching, but also took her to attend countless concerts and to play in many performing opportunities. Now Hana is heading to Indiana University in Bloomington, where she is planning to continue playing music, even though it’s not going to be her major. Congratulations and best of luck Hana.